Is your business successfully harnessing social data? 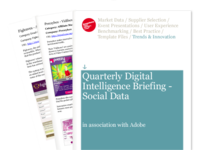 The fascinating topic of social data is the focus of the third Quarterly Digital Intelligence Briefing, published today by Econsultancy in partnership with Adobe. According to our report, only 16% of companies we’ve surveyed say they are ‘harnessing social data effectively’ for their businesses. Below I’ve summarised some of the key findings and subjects discussed in the report. What are businesses using social data for? This new briefing looks at a range of reasons that companies are using social data for, and how they rate their ability to use the data to help with these objectives. Social data can include information from sources such as social listening tools, social media management systems, Facebook’s social graph and on-site ratings and reviews. The chart below shows how companies rate their ability at using social data for various objectives including ‘gauging sentiment’, ‘enabling targeted and relevant communication’, ‘improving customer service’, ‘addressing specific complaints’ and ‘informing product and services development’. It is clear that companies struggle most when using the data available to understand the return on investment from social media activity and also the ROI from other types of marketing. 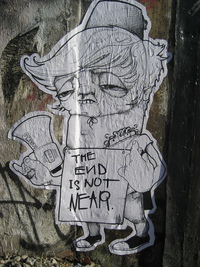 What challenges do businesses face? Our survey of (mainly UK and US) businesses found companies striving to embrace social data are most likely to be held back by organisational structures which aren’t conducive to a joined-up approach to data collection and analysis. Just under half of responding companies (44%) said this was a top-three barrier. As part of the same problem, a third of companies (34%) said that the separation of social analytics from multichannel analytics and business intelligence was a significant barrier. The increased availability of data from various marketing platforms and the resulting ‘data overload‘ is a theme familar with those reading Econsultancy reports over the last few months, for example the Online Measurement and Strategy Report produced in association with Lynchpin. This latest Quarterly Digital Intelligence Briefing contains a matrix which outlines the four-stage journey a company needs to take when moving from using social simply as a tool (and then as a channel), through to embedding social as a platform within the business on the way to becoming a ‘social organisation’. The use of social data underpins this model, and plays an important part across the five key pillars which support this model: Leadership and Culture, Measurement, Systems and Processes, Customer Experience and Use of Insight. One of the challenges companies face is being able to understand social data within the framework of existing customer data. As the chart below shows, social and CRM data are completely separate for the majority or businesses. This means they are missing out on an opportunity to build intelligence and improve their communication and marketing to customers at an individual and collective level. While organisations recognise the potential value of joining CRM and social (in a way which data privacy legislation allows), they are most commonly held back by ‘difficulty marrying disparate databases’ (49%), ‘processing social inputs into CRM-ready information’ (47%) and ‘technical issues’ (37%). As we explain in the briefing, these are problems worth overcoming because, as well as improving customer engagement, social CRM gives companies the chance to evaluate all types of marketing by following conversions back through the customer experience and examining the points of engagement in the process. It’s an exciting time for the email marketing industry, and no matter what Mark Zuckerberg says, the end is certainly not nigh, according to new research published this week from Econsultancy. According to Econsultancy’s 2012 Email Marketing Platforms Buyer’s Guide, the UK email marketing industry grew by an estimated 15.5% last year to a value of £388 million by the end of 2011. The research highlights that the rise of cross-channel marketing is helping to fuel growth in the email marketing industry. Rather than operating in its own silo, email is now seen as an essential component of a wider campaign. Thanks to the rise of mobile, email is now everywhere, accessible anywhere, at any time and at any location.